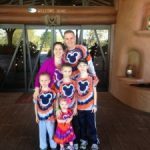 When I was given the task of writing an article about my favorite Disney Vacation Club® resort, my initial thought was “I can only choose one?” The Disney Vacation Club® (DVC) resorts that we have visited have all been a wonderful experience, however my most favorite is Disney’s Grand Floridian Resort and Spa. Disney’s Grand Floridian Resort and Spa has been around since 1988, and was originally called Grand Floridian Beach Resort but changed its name to Grand Floridian Resort and Spa in 1997. 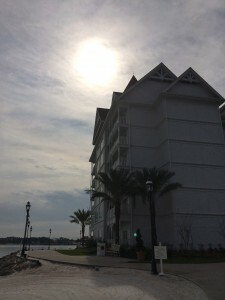 The resort was designed to resemble the Victorian Era resorts built along Florida’s east coast during the late 1800’s. The Hotel Del Coronado in San Diego, CA inspired the red gabled roofs and white exterior of the resort. Last fall, the doors opened to the much-anticipated DVC addition to the resort and guests flocked to be one of the first to catch a glimpse of the new DVC villas. This past February, I was able to convince my husband to stay at the new DVC villas. 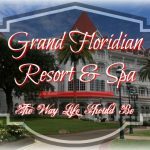 It has always been a dream of mine to stay at Disney’s Grand Floridian Resort and Spa, but to be honest, it’s pricey, and with our growing family, it was really never an option. 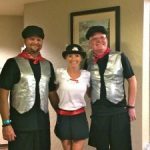 So, I was extremely excited to hear the news that Disney Vacation Club® was expanding to include my dream resort and I was thrilled when all of my….ahem…”discussing” paid off as I convinced my husband that we should spend the points and stay there during our Disney Princess Half Marathon weekend trip. So what’s it like? It’s big, and beautiful, and offers the same great accommodations and service you expect with a Disney Vacation Club® resort. DVC guests check in at the main desk located in the lobby of the resort’s main building. I have walked into that lobby many, many times and I am still mesmerized by the majestic features found through out the main building. The new building that is host the DVC villas is located on the south end of the resort property and is separated from the main building by the pool area. Since we had to walk past it to get to our villa, the pool area was the first thing we noticed and holy cow was it incredible! The pool itself is nice and has a water slide, but the main attraction to this area is Alice’s Splash Zone. This shallow splash pad has two little slides, sprinklers, buckets, and the main attraction—the Mad Hatter’s Hat. This gigantic hat fills with water at the top of the play area. When the hat is full it tips, dumping its contents on, sometimes unsuspecting, visitors. We must have stood there for 20 minutes just watching that hat fill and dump on the waders below. 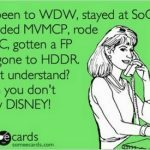 When we finally did tear ourselves away from the “show”, we were just a short walk from the entrance to the DVC building. The lobby of the DVC building definitely pales in comparison to the lobby of the resort’s main building, but it is still beautiful. The best part of the lobby is most certainly the penguin fountain located right in the center. I loved that fountain. It was the first thing we would see before we would exit the resort for our Disney day and it is the last thing we would see before turning in at night. The penguins depicted in the fountain are the penguin characters from the movie Mary Poppins. Mary Poppins has always been one of my favorite Disney Characters (I think because she had the ULTIMATE handbag), so seeing that fountain everyday really made my visit a little more magical. Since we have a big family, we reserved a 2-bedrrom villa. I had figured that the interior of our villa would be similar other DVC resorts at which we have stayed. However, upon opening the door to our villa every single one of us let out an audible “wow”. The door opens to a good-sized foyer and leads guests to the two-bed bedroom on the left, to the master bath on the right and into the kitchen area straight ahead. The foyer was spacious and it was big enough to park both our strollers and be the designated “shoe dump” area for seven people and it still had enough room for us to walk through easily! The kitchen was modern and spacious and had booth seating around the kitchen table. The kitchen contains just about all of the common items and appliances you would find at home-toaster, coffee pot, dishes, pots and pans…etc. The layout of the kitchen/living area is open and very bright. The kitchen opens into the living room where guests will not only find traditional furnishings but also a cabinet door that contains a secret hideaway bed. The villa is decorated tastefully and has several “Mary Poppins” themed items—which I loved, of course. We had a lake view villa so the sliding doors led to the balcony that overlooks Bay Lake. The balcony stretches the entire length of the villa and each bedroom has a sliding glass door that opened out to the balcony. 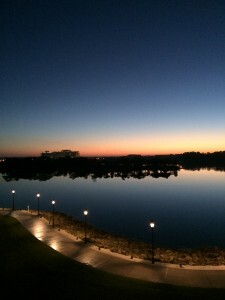 It was a beautiful place to watch the sunrise, the Electrical Water Pageant, or just to look out across Bay Lake. 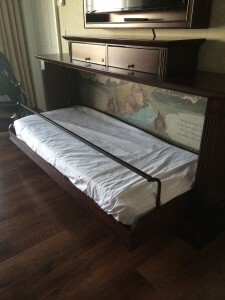 The bedrooms in the villa were similar to other DVC resorts. The master bedroom had a king sized bed where as the second bedroom had two queen beds. Each bedroom was decent sized and had plenty of room to store all of our things—no easy feat with 7 people. The big “wow” elements, at least for our family, was the claw foot tub in the master bath and the TV’s inside the mirrors of the bathroom. Yes, TV’s–IN THE BATHROOM! –not that my kids need, yet another reason, to take more time in the bathroom. 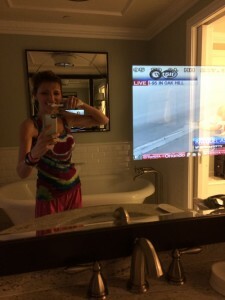 The TV’s are located in the corner of the mirror so it was easy to still brush your teeth or put on make up utilizing the mirror while the TV was on. It was really one of the coolest things I’ve ever seen. The second bathroom, on the second bedroom side of the villa, actually contained a shower and a shower/tub combo. This was extremely convenient when trying to get everyone bathed. So the villas were great, getting to the pool area is a breeze, and the DVC building is just a short walk away (if you cut through the pool area) from resort’s restaurants and shopping. The one drawback that we found with the DVC villas is the walk to get to transportation. In order to get on the Monorail or any of the resort busses, you do need to walk back to the main building. It isn’t a terribly long walk, but can seem like one for little feet at the end of a long day. The walkway between the main building and the DVC villas is covered, which is a plus, so if it’s raining, which happens quite a bit in Florida, you do not have to make a mad dash between raindrops. 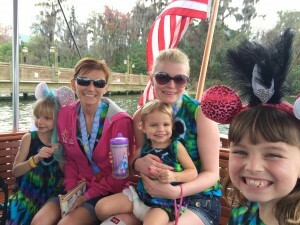 You can also take a water taxi to Disney’s Magic Kingdom or to Disney’s Polynesian Resort. Boat travel is always a hit with my gang so we used that mode of transportation quite a bit. 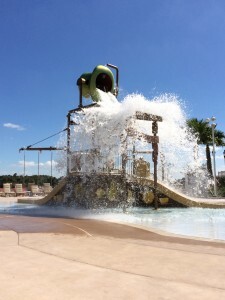 DVC guests can take advantage of the many amenities Disney’s Grand Florida Resort and Spa has to offer. From fishing and boat rentals to private cabanas and spa appointments there is something for everyone. They even have a campfire marshmallow roast at dusk and nightly movies on the beach. If you have yet to experience a movie on the beach, I highly recommend it. It’s a unique experience, lounging on a beach chair, watching a Disney movie. It’s one of those things that you would probably never do at home and should most definitely take advantage of while on vacation. Some people have commented that the overall atmosphere of the resort is “stuffy”. I did not find that to be true at all. I think some may get that impression simply due to the fact that the resort is designed to mimic the Victorian style resorts in which the elite used to vacation in back in the late 1800’s. Perhaps the Victorian design may give some folk the impression that this resort, too, is for the “elite”, but that is simply not the case. We found the resort to be relaxing and comfortable and the service outstanding. We absolutely LOVED staying at the Disney Vacation Club® Villas at Disney’s Grand Floridian Resort and Spa. We would most certainly stay there again, although since the number of DVC points needed for a stay is quite high, I am sure I will still have to do a little nagging…I mean…discussing…with my husband. ☺ But for now, I am most certainly glad we were able to enjoy the villas at Disney’s Grand Floridian Resort and Spa. It was an incredible experience. Episode 86: Road Trip!! 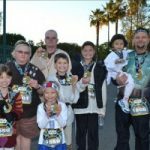 We’re Going to Disney! Thank you for your review of the DVC GF. we are staying the the villas this feb for 1 night to try it out before deciding to buy into DVC GF on the resale market. If I remember and can find this post again, ill report back in feb after our stay! Thank you for your review of the DVC GF. we are staying at the villas this feb for 1 night to try it out before deciding whether to buy into DVC GF on the resale market.